Have you checked out the new Philips Norelco – S9000 Prestige Qi-Charge Electric Shaver yet? Even if you weren’t thinking about getting a new shaver before, you will be now. Every man will want this new Philips Norelco – S9000 Prestige Qi-Charge Electric Shaver currently available at Best Buy. With the Philips Norelco – S9000 Prestige Qi-Charge Wet or Dry Electric Shaver you get an excellent skin comfort system that offers Philips’ closest shave with a reduction in redness and burning even on beards that are up to 7 days long. The S9000 has a BeardAdapt sensor that checks your hair density 15 times per second and then adapts the shaver to your hair automatically so dense beards are no problem for Philips’ best shaver. 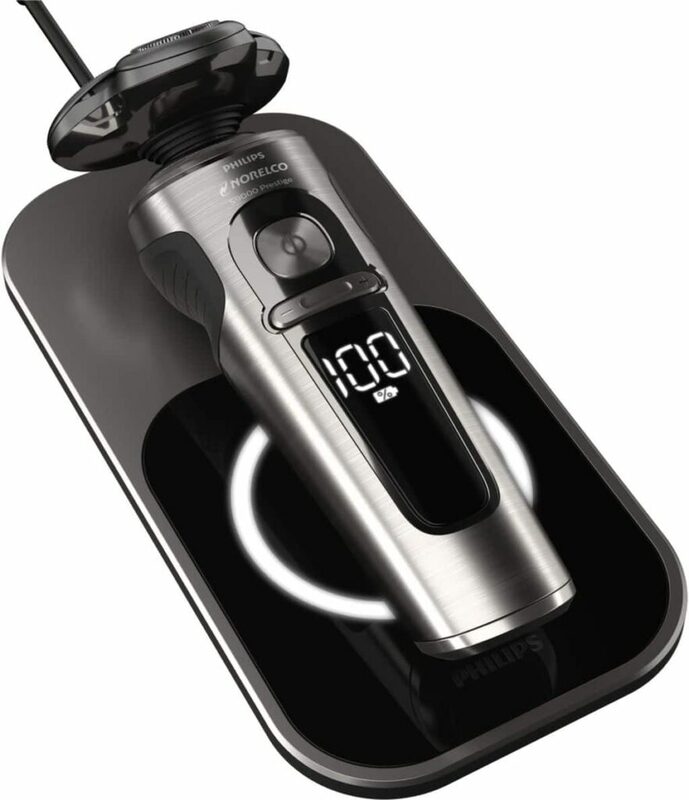 The Philips Norelco – S9000 Prestige Qi-Charge Electric Shaver gets the hair in every contour of your face, even those hard to reach areas like the neck and jawline, with its ContourDetect heads that move in 8 directions while gliding smoothly over the skin thanks to the SkinComfort rings that surround the shaving heads. Meanwhile, hairs are cut with the highest precision with the NanoTech precision blades that are strengthened with thousands of nano particles for an extremely close shave at skin level. Trim your sideburns and maintain your mustache with the SmartClick precision trimmer that attaches onto the electric shaver. The Philips Norelco – S9000 Prestige Qi-Charge Electric Shaver is the first of its kind with a Qi charging base which allows for wireless charging. Each full charge gets you up to 60 minutes of cordless shaving and the high-capacity battery fully charges in a little as an hour. The battery indicator shows when it’s time to recharge the shaver. Pick up the Philips Norelco – S9000 Prestige Qi-Charge Electric Shaver at Best Buy today and start enjoying the closest shave you’ve ever had. It’s an investment in comfort and convenience! This electric shaver would make a fabulous gift for that special guy.